Thanks to the usual vagaries of independent film distribution, The Apostle, a $5 million labor of love written and directed by Robert Duvall, opened in Canadian theatres some months after its premiere in the United States. But now that it’s here, Canadians can join their American counterparts in pondering the question: Who do men say that E.F., the preacher played by Duvall, is? To some, he is a radically on-fire servant of the Lord, a man so anointed of God that a Jewish colleague of mine remarked, after a press screening of the film, “It was as if Robert Duvall was possessed by the Holy Spirit.” But to others — a minority, perhaps — Duvall’s film indulges in stereotypes, portraying a church whose leaders are stained with sexual immorality and, moreover, don’t seem to care. 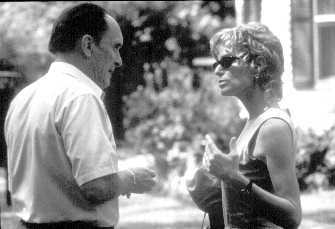 E.F. (Robert Duvall) and Jessie (Farrah Fawcett) in The Apostle. The truth, as often happens, is somewhere in between. The Apostle is well worth seeing if only because it portrays, with sometimes uncanny accuracy, an evangelical subculture that rarely gets a fair hearing in mainstream media. But it is not, on the surface, what one might call an inspirational film. The Apostle is populated by deeply flawed characters. But Duvall does not condemn them for their fallen humanity. Instead, one might say he sees them as God sees them, as sinners who, despite everything, are capable of receiving and conveying his love. How sinful? E.F. — his real name is Eulis Sonny Dewey — is a Pentecostal evangelist from Texas whose adulterous ways prompt his wife Jessie (Farrah Fawcett) to have an affair with their church’s youth pastor Horace (Todd Allen). Together, they get Sonny evicted from the church, and in a drunk fit of rage, Sonny hits Horace across the face with a baseball bat, possibly killing him. How loving? Sonny, having fled his home for Louisiana, rechristens himself The Apostle E.F. and starts a new church with the assistance of Brother Blackwell (John Beasley), a retired minister with whom E.F. comes to share a warm, even humorous, camaraderie. Together, they celebrate the love of Christ with a new congregation, renovating an old church building and spreading goodwill through care packages and radio broadcasts. Some have touted the film as a story of redemption, but the theme is not as obvious here as it was in, say, Tender Mercies, the 1983 film for which Duvall won his first Academy Award. If redemption means reconciliation, it is worth noting that the film never brings E.F. back to his family, not even for a confrontation. If redemption means repentance, and if repentance means changing one’s life for the better, then it is telling that, in some crucial ways, E.F. does not appear to leave his wicked, wicked ways behind him. He remains, right to the end, the sort of egotist who tries to worm his way into the bed of a not-quite-divorced woman, Toosie (Miranda Richardson), as surely as he worms the gospel into the souls of his converts. I don’t mean to sound callous, but E.F.’s attempts to bend virtual strangers to his point of view, be it sexual or spiritual, are eerily similar, and there’s a hit-and-run quality to the conversion scenes — three of them, at the film’s beginning, middle and end — that says as much about E.F.’s self-image and his need for emotional highs as it does about his concern for the unsaved. And yet, it would be unwise to confuse the character’s flaws with those of the film. Indeed, pinpricks of hope do, miraculously, shine through. To cite but one example, as E.F. drives off from his first convert — a barely conscious driver in a crashed car — the film cuts back to the wreck, as if to suggest that the prayers said by E.F. and his mother (June Carter Cash) may, indeed, be having an effect. E.F.’s motives may not be pure, but all the same, God can work through him — and, perhaps, through sinners like us, too.